Thanks to all the kind and generous bakers, writers and bloggers who have helped me make better bread than when I started out and who keep me company in this strange new world we find ourselves in each day. Your generosity and time are a precious gift indeed and you bring joy into my life and food and sustenance to my heart. Here is a selection of websites, blogs, resources that I am currently visiting. I am going to update this from time to time as there are always new people to meet with a fresh take on life. I I’ve put them in alphabetical order for now, as it’s hard to label some of the blogs as one thing or another and who wants to be labelled anyway? Some of these bloggers’ lives are taking them in different directions, children, work, change but they are all good companions! Cake Crumbs and Cooking C is a dedicated cake baker who can make a mean loaf of bread when she feels like it! Geraint Bakes Bread and writes about it beautifully over on the Fresh Loaf and has started teaching courses in Cardiff, Wales. I’ve seen pictures, I think he’s great! I’d go on a course of his if I was starting out. Gill the Painter Gill paints, bakes and is generally brilliant company. Holly Grove Kitchen – wonderful recipes here, beautifully photographed. Leavened Heaven – Will is another great food and bread blogger, witty and perceptive. Carl Legge Carl’s food blog with some great wild food recipes and sourdough experiments – we’re waiting for his permaculture kitchen book to come out in the autumn of 2013. Miskmask – Poet, Gardener, Cook and Breadmaker has several wonderful blogs going! 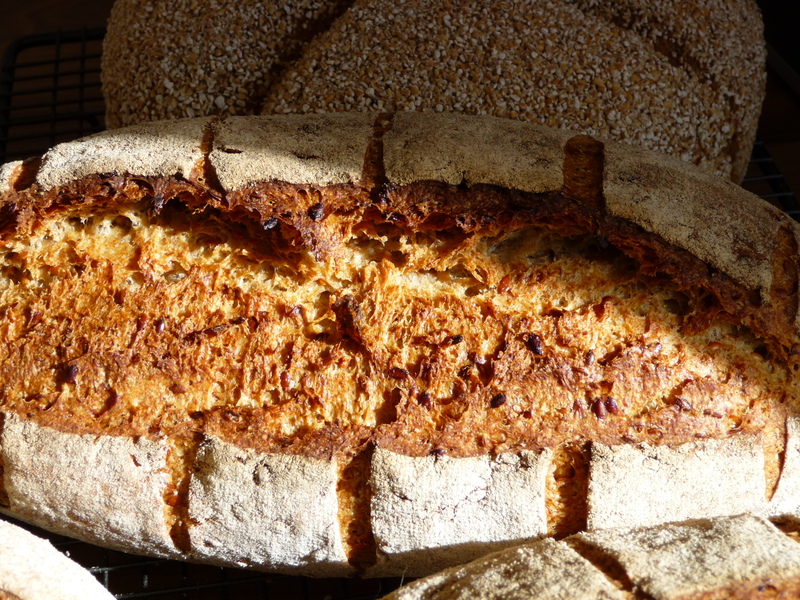 The Monday Baker – it’s all go here on this lovely bread and baking blog! Bagni Di Lucca Tuscany, Finland, a travel blog full of wonderful pictures and stories. Bewitching Kitchen Sally is a Brazlian born multi-lingual bread maker, scientist and blogger based in the States but whose interests extend far beyond. Cityhippyfarmgirl Funny and interesting Australian blog, great photos and lots of creativity and original thinking going on here. Farine – MC blogs so beautifully that she is a role model for anyone who wants to blog about bread and baking. You will find some fabulous posts here if you haven’t already visited her blog, you should! Dr Fugawe’s Lost World a brilliant blogger living in Oregon, mammoth squash wrangler and all round fount of knowledge on baking and fermentation. Currently on blog vacation. Fig Jam and Lime Cordial Visit my dear friend Celia’s blog for inspiration, tutorials and some great cake – say hi to her chickens! Gregoire Michaud was the pastry chef at the Four Seasons in Hong Kong, but is leaving to open his own bakery – he is also an author and active blogger and has a lovely site called Swiss Roots which I am currently exploring and getting to know! I have two of his beautiful books on my shelf. Hyperbole and a half is nothing to do with baking, though I did read a wonderful post about wanting cake on it. The writer is wonderful and you should take a look at her work. Thekitchensgarden is an incredibly exciting blog full of glorious photos and fantastic stories of life on a small farm written by a great story teller and photographer, Cecilia G.
Mel’s Home Baking Adventures – Join Melanie as she explores the wonderful world of baking! Onecoolsitebloggingtips Everything you could want to know to make your blogging better from the wonderful Timethief who has helped me to improve my blogging by miles! SincerelyEmily Emily writes about her life in Texas, her food, garden and lots more. I met her doing the Alphabet in August. She’s great fun! Steps on the Journey Heidi is another unique blogger, making everything from lavender wands to exquisitely decorated biscuits, her blog is full of joy and she is a kind and generous soul. The Road to Serendipity Narf 77 over in Tasmania is new to me but I feel like I am getting to know them fast over there. We are kefir buddies! The Weekend Bakery – Wonderful Dutch site run by Marieke and Ed in English with lots to read and watch as they bake in their Rofco ovens. Check out their latest croissant making video! Full of useful information and crystal clear how to’s and recipes adapted to suit their own unique style. Ye Olde Breade Blogge Nils has a wonderful collection of handcrafted rye recipes and is a great enthusiast, though lately we haven’t heard much from him on the baking front. Yumarama Bread Mr Mellow Baker himself! Currently at Baking School learning how the pros do it! Lots of wonderful how to do bready things. Including a step by step on the Pineapple Juice method of making a brand new starter. the loaf Andrew at the Loaf in Crich, a very succesful young bakery doing brilliantly! The Weekend Bakery have a wonderful site full of recipes, theory, knowledge and enthusiasm and a webshop which has some wonderful things including my favourite oval Herbert Birnbaum wood based banettons and their own custom design lames. Sous Chef Co UK has a vast Aladdin’s Caves of goodies from around the globe, from chocolate supplies, to chillis and baking kit. Fantastic customer service! Bakery Bits has a wide range of baking equipment and has grown its range in recent years.